Did you start 2018 with high expectations of upping your exercise, improving your nutrition and toning up? Sound familiar? So often we put unrealistic demands on ourselves to make dramatic changes to our lifestyles when in fact January is a pretty challenging month without the added pressure. Tell us a bit more about Fitty London, what it's all about and how did you come up with the idea? 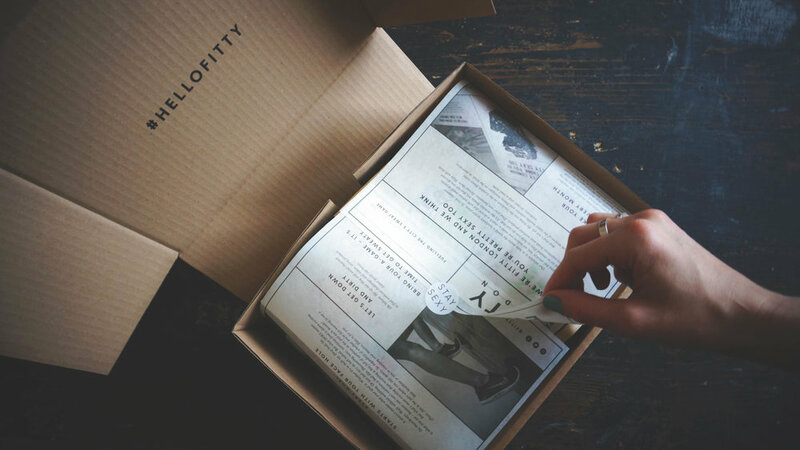 So, Fitty is the monthly health and fitness subscription box. It’s a super exciting and easy way to discover the hottest nutritional foods, drinks and training products to fuel your sweat game – from protein powders and superfoods to resistance bands and muscle rubs. It’s like your birthday every month! I started it because I realised there’s so many products and so much information out there to sift through - it’s pretty overwhelming! Fitty cuts through the crap, curates the best products you need to know about, and brings them directly to you. Essentially we do the hard work so you can do yours in the gym. Ultimately it’s something I really wanted but it didn’t exist, so I decided to create it! Sounds fantastic, and so necessary! What are some of your favourite brands that you've worked with for Fitty? Can I say all of them?! Nothing makes me happier than discovering amazing products and brands and sharing them with everyone. Working with boutique gym UN1T to create a series of bespoke boxes for their members was amazing. We love a good morning routine and believe this can set you up for the day ahead. How do you usually start your day? Totally agree – I’m a huge believer in morning routines! As soon as I wake up, I spend about five minutes thinking about what I’m really excited for that day. It puts me in a good mood, and stops me instantly looking at my phone. Then I enjoy a bulletproof coffee and breakfast and get cracking with my day. An omelette with loads of veg in, or protein porridge. Where's your favourite place to workout in London? That’s tricky! Weightlifting is my go to, but I’m really getting into gymnastics and calisthenics at the moment and am lucky to train with some experts at various gyms across London. I also love going to the boutiques like UN1T, 1Rebel and One 10. And favourite place to relax and unwind? It sounds wanky but Shoreditch House is amazing in the sunshine with friends. I love films so going to the cinema is always a winner too. ‘Don’t think like a small business’ has always stuck with me. Generally, I think you can learn so much from other people and so I’m always chatting to fellow founders, listening to TED talks and reading books – I’m currently reading Business For Punks. I have three top hacks. Number 1: Each day I write down the three key things I need to achieve in priority order, and in another column I write all the other jobs I’ve got on. I schedule chunks of time to get the top three done, and dip in and out of the rest. Number 2: I’m currently using MeisterTask (a task management tool) where I put every project, job and task so it’s not all floating around in my head, and I’m finding that realty useful. Number 3: Diet is absolutely crucial to feeling switched on and performing well (hence why I started Fitty!). For me, a high fat diet is great. And finally, what's next for Fitty Ldn? We’re currently working on a really exciting partnership with a boutique gym, and we’re about to create boxes for a few companies and their employees which is fantastic, and I think a lot of our growth is going to come from the corporate sector. Restorative yoga class or sweaty hiit session? No matter how much I try and convince myself otherwise, sweet. Get your hands on a FITTY LDN box here! Older PostMAKING HEALTHY HABITS STICK!